In Choosing Between RESTful Web Service, SOAP, you learned that Representational State Transfer (REST) is an architecture style or design pattern for creating web services which allow anything connected to a network to something else on the network using Hypertext Transfer Protocol (HTTP). Web Services expose data and functionality through resources identified by a Uniform Resource Identifier (URI). 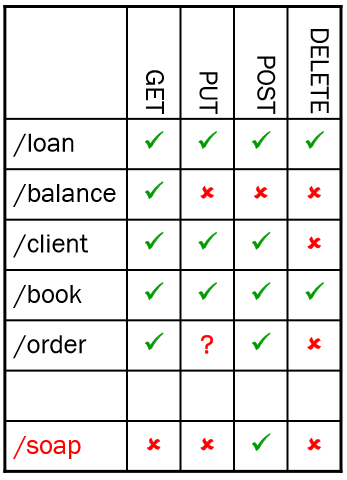 REST has a uniform interface where clients perform stateless interaction with resources using a fixed set of verbs, typically GET (read), PUT (update), DELETE, POST. You can have multiple representations of the same data. Hyperlinks model resource relationships and valid state transitions for dynamic protocol description and discovery. Although there are four methods, you can add more resources, such as an author. And you can have multiple representations. Let’s create a simple example in a polling scenario. in our scenario, you have polls and votes. It’s a containment relationship where you have number of polls in which you have a number of votes. The URIs embed the identifiers of child instance resources. POST on the container is used to create child resources. PUT/DELETE us used for updating and removing child resources. In the first step, you create poll. In this case, we will use XML in the body. But you can also use JSON. In this case, the poll was created using POST with the possible options that the user could select. The server returns a 201 response with the location of the poll and its identifier. The client can then send a request to the server to read the poll. p>The poll with its identifier are retrieved with 200 OK in the response. The response body includes the options and the reference for the votes. 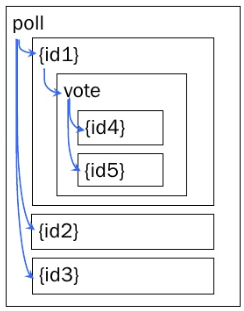 In this step, you would post the data and return that the data vote was created. The response includes the location of the vote. You can then retrieve the votes. You can now let your user change their mind. In this case, use a PUT to update the particular vote. Note that the URI goes to vote/1. You can then retrieve the poll results again. You can then use the DELETE verb to delete the poll. The server returns an 404 Not Found error because the poll has been deleted. How can consumers take advantage of multiple evolving endpoints? You need to keep your consumer up to date with respect to evolving contracts. In the previous example, you saw how a Uniform Contract provides for Create, Read, Update, and Delete. GET is a read-only operation. It can be repeated without affecting the state of the resource and can be cached. NOTE: This does not mean that the same representation will be returned every time. 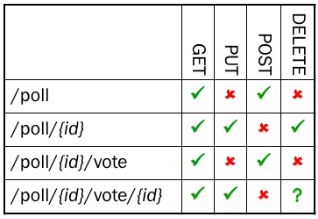 POST is a read-write operation and may change the state of the resource and provoke side effects on the server. How should you create a resource? The downside of this is that how are you sure the client creates a unique identifier? The downside of this is that duplicate instances can be created if requests are repeated due to communication issues. How do you provide the consumer with information so they can adapt to changes in your service. For example, you may want to change the structure of your data. It may not be possible to replace all of your old endpoints simultaneously. In that case, you can automatically refer your consumers that access the stale endpoint to the current identifier. How can service consumers support new consumers without changing their contract? How can you change the content and data representation formats? You want your Web Service to provide for loose coupling, increased interoperability, and increased organizational agility. You can perform content negotiation across different dimensions. For more patterns, see SOAPatterns.org.